Louis Suburban Chapel, where we treat every family that we serve, as if they were our own. where we provide Jewish Funeral Services in Bergen County. Louis Suburban Chapel is honored to be serving the Jewish community for over 65 years. We encourage you to call us anytime, day or night, for funeral services, planning, pre-planning or support. The Jewish funeral home is an important part of any community. In addition to providing a variety of necessary funeral services to the community such as burial services, memorial services and celebrations of life, funeral parlors also serve as resources for those grieving the loss of a loved one. At Louis Suburban Chapel, family comes first. From the moment that we are involved, we work with the family to bring dignity and caring to the entire funeral process. All of our team members are compassionate and trained professionals familiar with the Jewish Religion and their traditions. We strive to honor the traditions of both your family and your faith. We understand the profound religious significance associated with Jewish funeral traditions, and assure you that at this most difficult time, you and your family are served with the utmost respect and in accordance with the Jewish funeral and burial customs that are important to you. Our readiness to prepare a funeral at your time of need is what distinguishes Louis Suburban Chapel, and has earned us the respect and loyalty of the Jewish community. 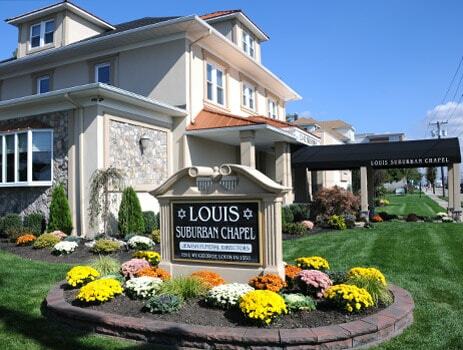 Louis Suburban Chapel is easily accessible from anywhere in the New York metropolitan area. Our main chapel seats 400 people and we accommodate both New Jersey, New York cemeteries, and burials in Israel. Our caskets cover a spectrum of materials and prices. The traditional Jewish casket is all-wood constructed. We have a wide variety of wood caskets including pine, poplar, oak, maple, cherry, walnut and mahogany. We also offer metal caskets, including bronze, copper and steel. Caskets can be viewed at our location. Please visit our Online Gallery. In New Jersey, Beth Israel Cemetery and Mount Lebanon Cemetery, may require the use of a concrete casket protector, or a concrete burial vault. We will assist you, if this is required. In Jewish tradition burial vaults are not used. according to Jewish burial customs. However, we have a wide selection of sealed concrete vaults. When it comes time to care for a deceased loved one, you may feel overwhelmed and confused about the next steps and options. Our funeral home staff members are here and ready to help. Whether you’d like a funeral or a more creative celebration of life, we can assist you to select the funeral service options that hold the most meaning for you and your family. We can be your guide and your ally whenever and however much you need us. We are here to support you in making each arrangement decision. Simply contact us at 201-791-0015. Or, if your need is not immediate, drop us an email using the contact form.